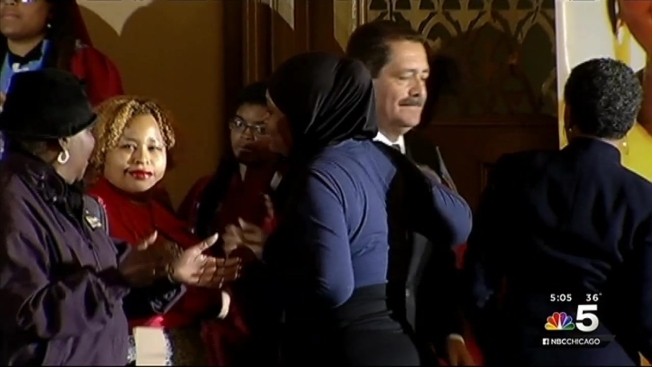 Mayor Rahm Emanuel's and Jesus "Chuy" Garcia's paths crossed as they hit the streets for an important weekend of early voting and competed yet again for the key African-American vote. Both candidates attended the Black Women's Expo at McCormick Place Saturday afternoon, but at different times. The expo features speakers and exhibitors that allow attendees to discuss solutions for the issues African-American women face in their everyday lives. For Emanuel and Garcia, the expo is also another place to court the African-American vote, especially during this crucial early voting weekend. Voter turnout on Election Day is expected to be low because it falls in the middle of Spring Break for Chicago Public Schools and several area Catholic schools. With the Easter next weekend, this Saturday and Sunday are likely to be some of the biggest days for voting. Emanuel's public schedule for Saturday is shorter than Garcia's, but the mayor will likely make several "unscheduled" visits throughout the day. In addition to the expo, the mayor was slated to host a get-out-the-vote rally on the South Side with performances by the Jesse White Tumblers and the World Performance Drill, among others. He also attended another rally in support of his re-election at the Harold Washington Cultural Center. Garcia made yet another appearance at the Rainbow PUSH headquarters Saturday morning before heading to the South Side, like Emanuel. He was scheduled to attend rallies with Ald. Toni Foulkes and Ald. Ricardo Munoz as well as attend a meet-and-greet with voters on the South Side. The final scheduled stop for Garcia was at the SEIU's Latino Caucus annual meeting. The candidates are in the final stretch of what must be an exhausting election for them both, and whomever gets the most voters to the polls this weekend could emerge the winner on April 7.